Preservation methods: Please keep in dry, cool place and avoid direct sunlight. After opening and finish it as soon as possible to avoid deterioration. Caution: To avoid choking, this product must be chewed thoroughly before swallowing. For children or elderly people, please cut into small bite-sized pieces before eating. Do not eat while playing. 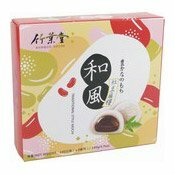 Ingredients: Maltose, Red Bean Paste (Maltose, Red Bean Paste, Red Bean, Sugar, Palm Oil) (35%), Glutinous Rice Powder (6%), Millet, Sugar, Palm Oil, Thickening Agent (E1442), Sweetener (E420), Flavour, Preservative (E200). Simply enter your details below and we will send you an e-mail when “Traditional Style Mochi Rice Cakes (Red Bean) (和風麻糬 (紅豆))” is back in stock!